Cranfield MBA Juan Guerra got his first taste of crowdfunding in his native Mexico, and now he's launching StudentFunder.com in the UK! He tells us what to expect from the service. 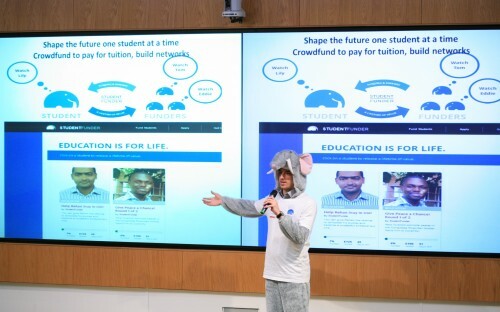 Juan once trekked across the Alps dressed as an elephant to raise awareness of StudentFunder! StudentFunder is a service that helps students who are short on money (and who isn't these days?!) raise funds for their education. It was created by Juan Guerra, a Cranfield Business School full-time MBA. Juan, 27, comes from Mexico. His first attempt at crowdfunding occurred as a 19-year-old, when he was looking for funds to pay his way through university in Germany. We spoke to Juan to learn more about how he’s turning a personal experience into a venture that could potentially benefit thousands of students from around the world. Juan explained the idea of StudentFunder to us. “If you want to study but you don’t have enough money, you have a means to reach out and let people help you while offering them something in return. This also helps you build your network and find mentors. Juan graduated from the Cranfield School of Management full-time MBA in 2011 and worked for an insurance company, Prudential Plc, as an Organisational Effectiveness consultant for a year. He stared working on StudentFunder in his spare time and began working on it full-time in October 2012. So, how can students in need make the most out of StudentFunder? Students first apply via the website, answering questions that help the StudentFunder team figure out if their aims are aligned with StudentFunder’s goals. Juan said that students who are likely to do well are those who are willing to think of something that they can offer their funders. When Juan sent out an email as a 19-year-old, he was selling puppies and insurance and asking for advice. Even though no one bought insurance or puppies, people felt touched by the offer and decided to help him in many different ways. According to Juan, crowdfunding typically raises about £17 per day per project or idea. There are miracles but they are few and far between! StudentFunder is currently focused on helping students get small top-up funds that might contribute to flight tickets or to round off thousands that they have already raised from other sources. StudentFunder offers advice to students who use the platform on how best to improve their chances. Students are advised on skills that they can learn and market in return for cash. “We can help you build someone a website, offer online tutoring, become a freelancer, or exploit scholarships. It’s not about hand-outs or begging: it’s about selling”, Juan explained. Student Funder hopes to build more of a funding "eco-system" and move into offering loan facilities as they grow. Juan’s rationale is that doing so can help students with higher targets raise more money. “Your cousin might donate £100 through a site like ours but she may be just as likely to offer you £1000 as a loan”, he said. As StudentFunder is new, it's focused on finding the right talent to join the firm, as well as raising investor funding. The company has benefitted from Cranfield MBA expertise from the start. Juan told us that he has a very good relationship with Cranfield. When the company moved to its London office, Juan called on Cranfield’s career services and soon had a team of “amazing Cranfield volunteers”. A few of them are now moving on to full-time roles at other organizations so Juan is testing out other people. He isn’t in a hurry to hire to fill roles since, “The first ten recruits are like a marriage,” and not to be hired in a rush! Juan chose to establish his venture in London because he thinks it's a very good environment for start-ups, especially social ones. “You have higher chances of success than you would in most parts of the world”, he said. Juan told us that StudentFunder is getting great feedback as it prepares to raise investor funding. There are already a few platforms offering loans at low interest rates to students such as Social Finance, which allows graduates of 79 schools to refinance existing loans and Prodigy Finance, started by INSEAD alumni, has been successful in Europe. CommonBond, a new service offering 6.24% fixed-rate student loans to more than 50 Wharton MBAs plans to go national in the US this year. All these start-ups use an alumni lending model. Juan says that Student Funder’s service is unique in that it not only helps students fund their studies and learn valuable skills in the process, but it also helps them become part of a network that they can grow andbenefit from in the future. Head over to StudentFunder.com to learn more about them. Read more articles about students, alumni and programmes at Cranfield School of Management here.